In Asia, night markets weren’t created by hipsters to be quirky and retro. Night bazaars have existed as far back as the Tang Dynasty in 836 AD and became common in 1950-60’s Taiwan where migrant urban workers would grab a meal alone or with families. If you haven’t been to a foreign night market, let me describe the noisy cheer you’ve missed. 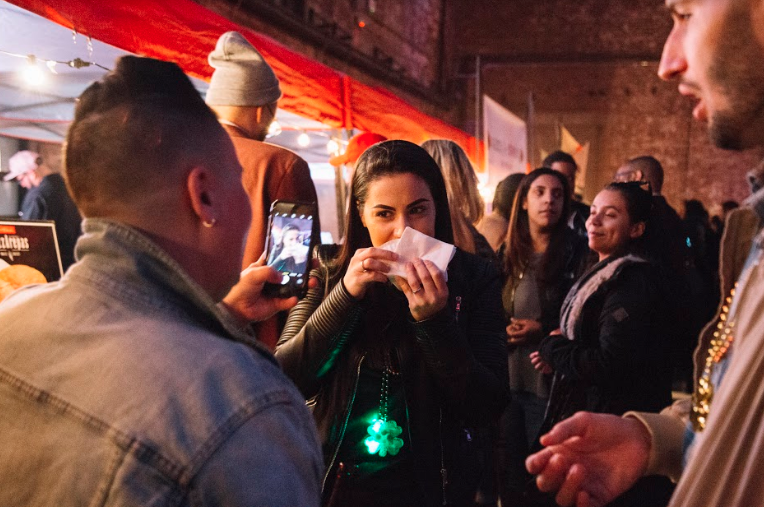 The night market is a place where friends, family or solo people are delightfully bombarded with the smells of home-cooked foods while immersed in a cacophony of chatter, laughter and cooking sounds. It’s a casual place to enjoy yourself and get cheap eats late into the evening. Asian night markets are low brow culinary social fun. New York City has tried to copy this concept in a few boroughs. But every time I’ve gone to any of these food markets, I find the portions tiny and the food overpriced. 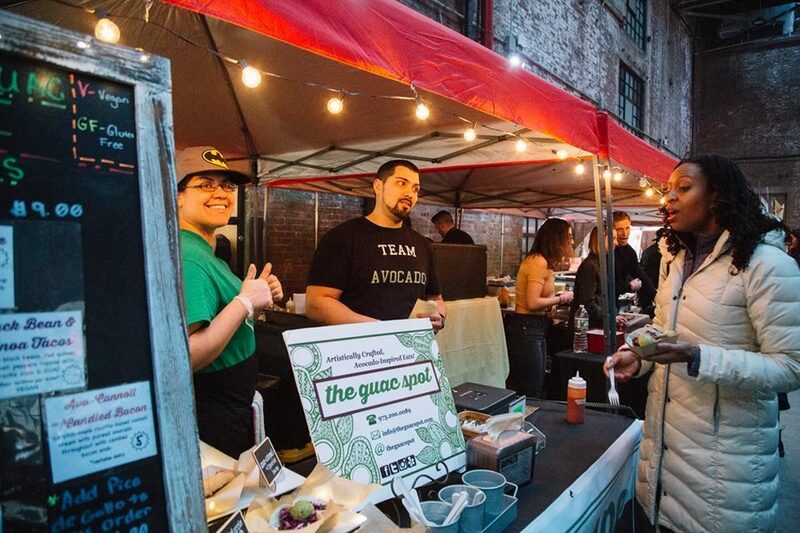 However, here in Jersey we’ve got two founders who created their unique Jersey twist on the night market, and affordable at that! 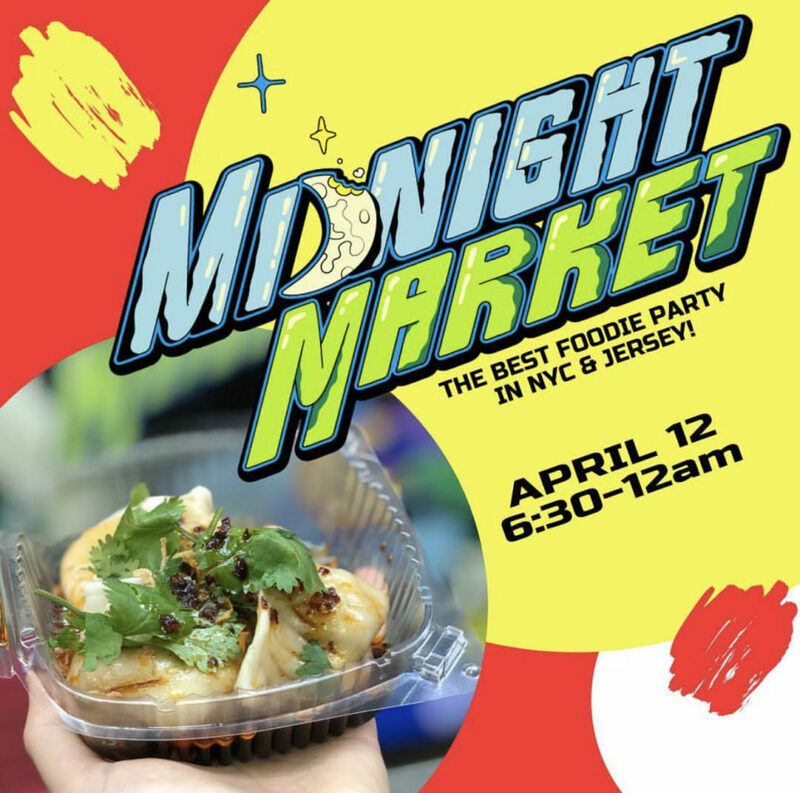 The Midnight Market is a fun night out for adults only, with an affordable and curated selection of delicious local food vendors. What inspired these Alysis (aka Lisi) Vasquez and Perla Nieves to start it and what was their path? 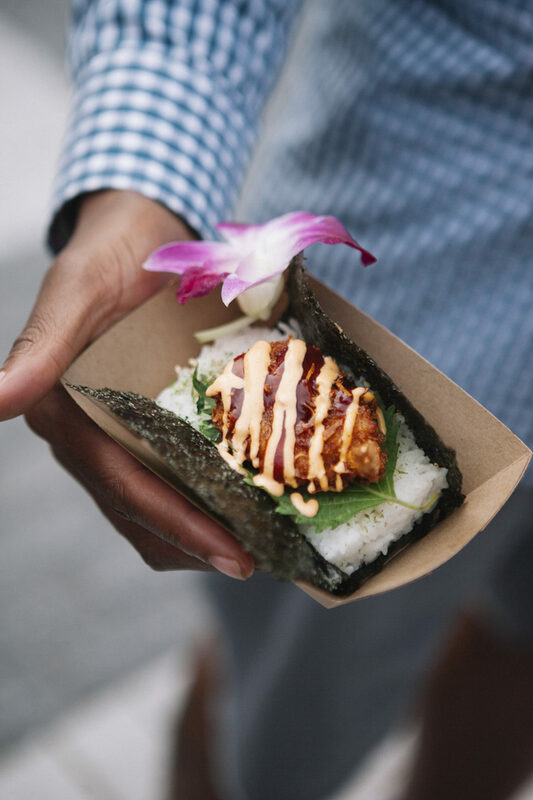 Lisi: Midnight Market is a 21+ night market for foodies that features 20 food vendors who make small bites for small prices. Midnight Market also features a DJ and bar for all night happy hour. We host an event on the second Friday of the month. Lisi: I’m originally from Piscataway (Central Jersey), moved to Maryland, and came back for college (Rutgers). Perla: I’m from Somerset (Central Jersey), but originally the Dominican Republic. Lisi: Perla and I met as servers at an IHOP in Somerset, NJ. Perla was in high school and I needed a job during freshman year of college. What makes your market different than others? Perla: We are the area’s first age 21+ night market and we’re indoors. All other markets are open to the public and outside. We decided to make our market indoors so it allows vendors to operate in any season. Weather doesn’t affect us. Lisi: Another thing that makes us unique is our price point. It’s a foodie’s party without breaking the bank. Lisi: Perla and I had already been living in Jersey City for years and noticed the change in the food culture. I had a catering company at that time of our idea (August 2016). 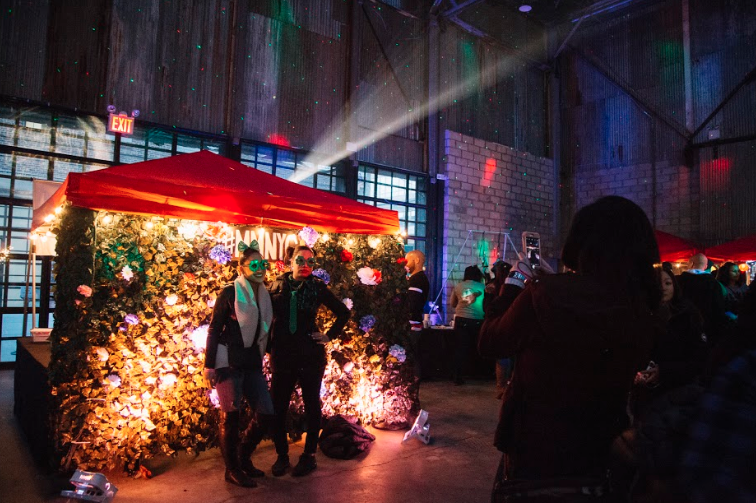 We noticed the outdoor market scene was difficult to break into for new vendors and ideas. I always saw the same vendors and food concepts at the festivals. We thought it would be more interesting (and tasty) to have a rotating list of vendors. We wanted to bring something to Jersey City that could compete with the events in NYC. The most important thing was to make sure it was affordable and accessible to everyone. Perla: We created the idea in August 2016 and our first event was Nov 4, 2016. Originally we were hosting the event at Transmission because we thought we would have 300 people. We saw the RSVP list growing on Facebook and knew we needed a bigger space. Lisi found Harborside Atrium. We ended up having 3000 people come while we were only prepared for 600. It sounds successful but, it was disaster. We had lines out of the door while vendors ran out of food and the bar ran out of alcohol. It was a huge learning lesson for us. At the second Midnight Market, we invited everyone back who bought a ticket from the first. We ended up with 1000 attendees with 24 vendors. From that event, we learned that the ideal number of vendors is 18-20. Since then, we’ve done 25 events in Jersey and 3 events in Brooklyn that have been hugely successful. Lisi: In total, we only paid $100 for Facebook advertising. Since Perla has experience in video editing, she created videos and photos which we posted (free) on Facebook and Instagram. It was through those free social media outlets that people found us! Lisi: It’s just the two of us. We do everything until the day of event. On our event days, we hire friends and family. We also just started accepting volunteers. We’re very excited about that. How do you combat your self doubts? Perla: What pushes me is that we built a big network of 150-160 vendors that believe in us. Through the good and bad, the vendors stick with us. These people have become our friends and part of our lives – it helps keep us going. Lisi: Perla and I used to live together. We’ve also been best friends for over 12 years now. We understand each other and balance each other out. I trust her on every level – we share a bank account. That is serious business! Our relationship and my entrepreneurial spirit keeps me going. Lisi: Multiple cities. Since our 3rd event, we’re convinced that we have to take this everywhere. Perla: Our friends from other states have told us that we need to bring Midnight Market to them. Lisi: I would say being from Jersey, there’s an element from hutzpah. People in NYC are always looking for something to do. So, you don’t necessarily have to be known for people to try you out. In Jersey, you have to be fabulous. You have to drag them out to try it. That makes us work harder. Jersey has seriously loyal and proud customers once they’ve tried our events. What’s one of the strongest tenants you live by in your business? Perla: One thing we are feel strong about is not selling ourselves short and taking advantage of our vendors. It is vital that the vendors make money and have a great experience doing it.